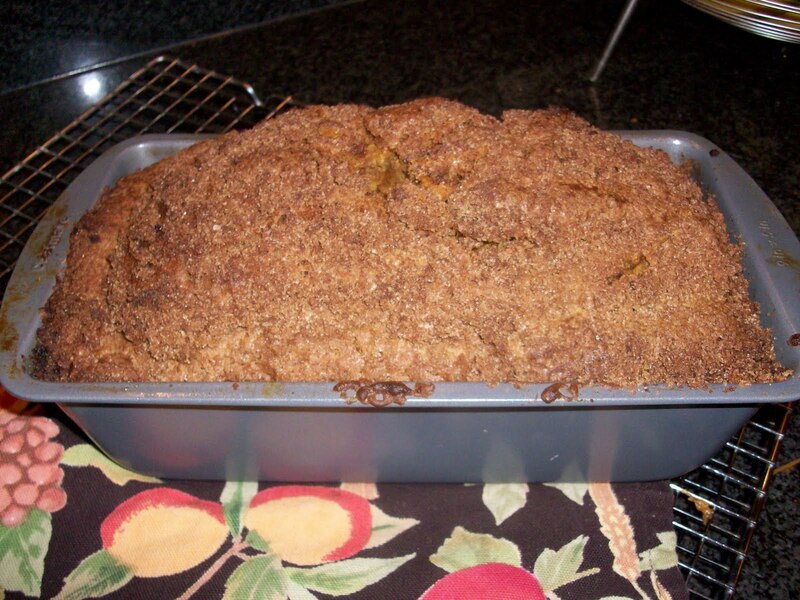 With fall upon us, I thought it was time for a heart-warming recipe for a good old-fashioned baked treat that will fill your house with the autumnal scents of pumpkin, brown sugar, cinnamon and pumpkin-pie spice. Hungry yet? The recipe you see pictured is for a bake sale at school--I'm slicing it up into individual slices and asking top dollar! (Hey, it is a fundraiser.) If you make it, you'll know why I am upping the sale price. It's crazy good and so versatile--it works for breakfast, brunch, snacks, with a cup of tea in the afternoon, you name it! I customized this recipe from a similiar one I found in the Gourmet Magazine cookbook. One thing I changed was the streusel topping. Unlike many streusel toppings out there, the one I've devised manages to be crunchy and nut-free at the same time. Enjoy! Blend together flour, sugar, butter and cinnamon in a small bowl with your fingertips until the mixture looks like coarse meal. Place rack in the middle of the oven and preheat to 350 degrees F. Spray Pam with flour on two 9 x 5 inch loaf pans. Sift together flour, salt, baking soda, pumpkin pie spice in a medium bowl. In a large bowl, whisk pumpkin, sugar, eggs and oil. Add flour mixture to large bowl and stir gently until well combined. Divide batter between loaf pans. Sprkinkle half of topping over each. Bake until a wooden skewer inserted in the center of the bread comes out clean 50-60 minutes. Cool loaves in pan on wire rack for 45 minutes, then turn out of pan and let cool completely on rack, about one hour. Wrap well in plastic wrap and foil to keep refrigerated for about a week. Can also be frozen up to one month.